Disseminating work beyond the walls of the studio is integral to the development of an artist's practice. Conversation fuels the creative process with a new energy that can only be attained when it is exposed to outside perspectives. 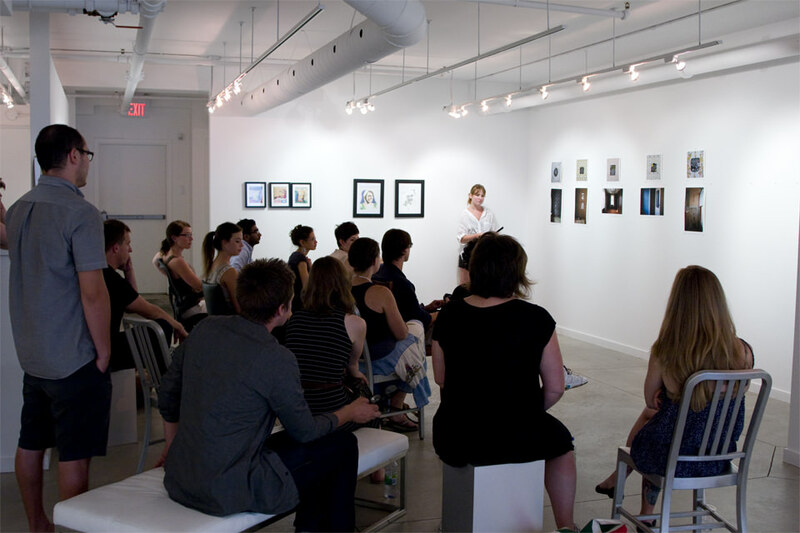 Following the success of the first initiative in November 2014, O'Born Contemporary and Artscape Youngplace are pleased to present the second CRIT AT THE HALLWAY GALLERIES, offering wall space to local artists for an opportunity to both rediscover the importance of peer evaluation and connect to the current creative community in the city. Participants will have the chance to access the Hallway Galleries with waived rental fees, and participate in a group event and receive feedback from many perspectives. For this CRIT AT THE HALLWAY GALLERIES, O'Born Contemporary and Artscape Youngplace will invite guest participants including artists, gallerists, curators, and writers to contribute to the conversation and enrich the experience for all. • The preparation of their works for installation and transport to Artscape Youngplace. • Installation of their works Monday, February 9, between 5 pm and 9 pm. Artists are allowed the option to self-install works at no charge following the Hallway Galleries' installation guidelines. Artscape can also organize professional installation with secure installation hardware at an additional charge. • Participation at the CRIT and Opening Reception, Wednesday, February 11, 6:30 pm and 9 pm. • Removal of their works and hardware on Saturday, February 28, between 3 pm and 8 pm. Providing art work details for standardized exhibition signage by Monday, February 9 at 9 pm. The Hallway Galleries is an impressive public exhibition space located at Artscape Youngplace (180 Shaw Street) in West Queen West, one of Toronto's most creative neighbourhoods and a major centre for contemporary art in Canada. The building is open to the public daily and frequented by artists, cultural workers and the community. Spanning 9,350 sq.ft. of spectacular corridor space on three floors, the Hallway Galleries are ideal for a wide variety of art forms and curatorial projects. Hallways are 125' in length with 14' ceilings throughout and are equipped for visual art installation in a variety of media. • First Floor: Four permanent vitrines (94 sq.ft. total) with depths ranging from 8"-18" and featuring internal lighting, security locks, cork-covered plywood mounting surfaces, and access to power. There is limited access to additional wall/floor space throughout the first floor and mezzanine. • Second Floor: ~1,080 sq.ft. of reinforced gallery wall surface in 16 distinct areas, 8' in height and ranging in length. Each area has adjustable full-spectrum lighting, access to power and is suitable for security installation hardware. Access to limited movable vitrines. • Third Floor: ~1,120 sq.ft. of reinforced gallery wall surface in 17 distinct areas, 8' in height and ranging in length. Each area has adjustable full-spectrum lighting, access to power and is suitable for security installation hardware. Access to limited movable vitrines.